HAPPY BIRTHDAY TO YOU ZH! Would like to thank my friend "M" for buying the gadget from USA and bringing it back to me.... without that I will not be able to make the strings so nicely. Also a special thank to my son for lending me his guitar and helping me to improve the shape of guitar. 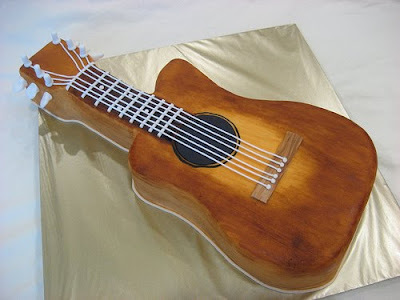 Am really glad with how this guitar turns out tho' it took me quite a while to complete the whole cake. 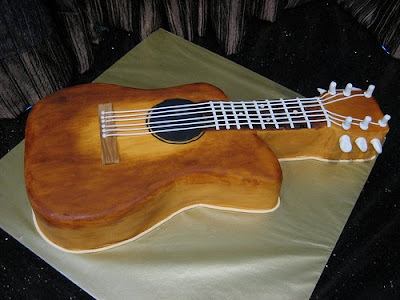 It's looks like a real guitar woh! Thank you cherry potato! Am also happy with how it turns out, so does the recipient. Wow, KH it looks great. I would like to have that garget also. It will be a breeze to just press out a long string of sugar paste. Yes yes LeeLee, it's great investment (tho it didn't come cheap)! Strongly recommend that. If you need to find out more, email me. Snooky doodle, thanks for your kind words, am still learning to do better. Visited your blog, you did very nice cakes!